The software allows a user to add and export multiple AOL PFC files to MBOX file format. The mailbox file can be accessed in a number of email clients like Mozilla Thunderbird, Apple Mail, Netscape, Google Takeout, etc. 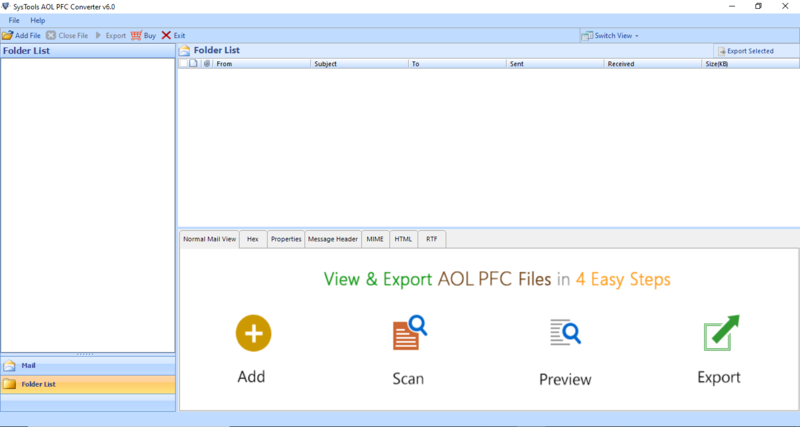 You can easily convert all or selective AOL PFC files. PFC to MBOX File Converter facilitates its users to import only those PFC data, which they want to save in mailbox format. For this, one just needs to select the number of data items to export and then, continue with further exporting procedure of the tool. 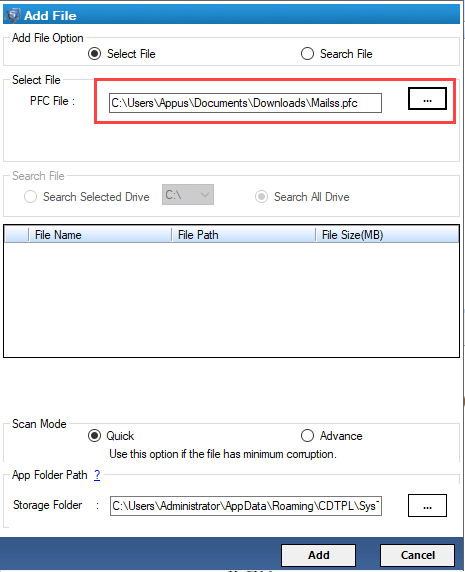 The AOL PFC to MBOX Converter Tool helps a user in maintaining the original structure of the folder within the PFC file. The application is enough capable of converting PFC files without affecting the meta attributes of the email like Cc, To, Bcc, subject, etc. There is no restriction on exported PFC file, which is retrieved from AOL desktop-based email application. Apart from this, PFC to MBOX Exporter does not require installation of any supportive email client. You can easily export any number of files to the desired format. AOL PFC converter is a software which is Windows-based and a user will not face any compatibility issues in any of the older versions of Windows OS. The software supports Windows 10 to all other below versions and works smoothly in your system. There is Date Filter option through which you can select a number of emails from the range of a time period and export them to MBOX file format. This allows a user to filter only necessary data items according to the date range and converts to the MBOX format. The trend is changing and every person wants to work according to the latest trend. Therefore, here we are offering a direct solution to convert AOL PFC to Thunderbird MBOX file format. One just needs to extract PFC file from AOL desktop and then, browse it in tool’s window. The Demo version of the software can only convert first 25 items/folder of PFC file to MBOX file format. AOL: AOL Desktop versions 10.0, 9.0, 8.0, 7.0, 6.0, etc. Explain brief functioning of the software? Step 1: Install and Run the AOL PFC Converter software on your system. Step 2: Add and scan the PFC file. It shows all the data items. 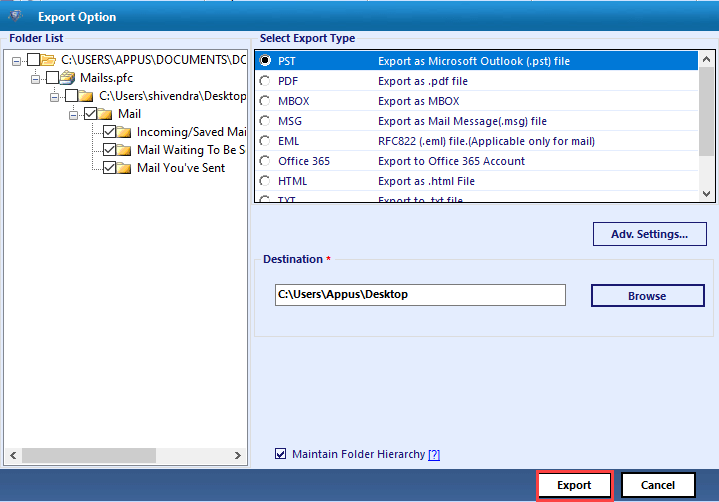 Step 3: Click on MBOX radio button and select specific emails to export. Step 4: Click on Export button. Apply mail filters for selective data conversion. Step 5: Browse the destination location & proceed with the process. Step 6: Now, your PFC file is converted to MBOX format. How will I import resultant MBOX file in Thunderbird which will be originated by your AOL PFC to MBOX converter tool? 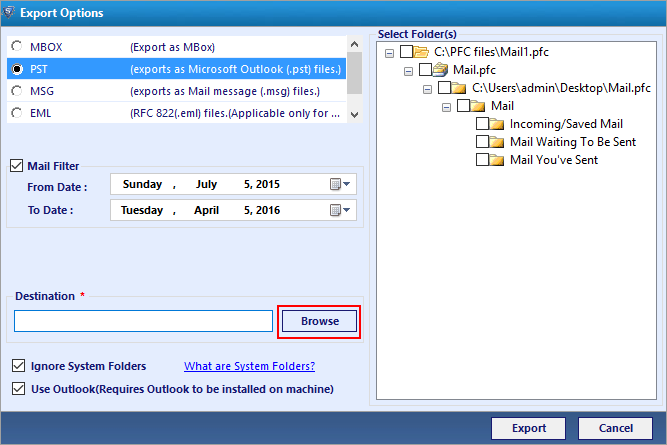 Is there any solution to export a single mail of PFC file in MBOX file format? I want to transfer AOL PFC to Mac mail because I have switched my working operating system from Windows to Apple OS. Well, I have already converted PFC files into MBOX with help of your utility but, I do not know the solution to import .mbox file in Apple mail. Can anyone suggest me a solution for the same? "PFC to MBOX converter is a program, which enables users to rapidly export AOL PFC emails into MBOX file. I was able to convert 1.23 GB of my PFC file, with high email integrity in few minutes. I am really grateful to this tool because I had never expected that I will be able to finish up this email migration task so easily. Thanks to Freeviewer developers for such innovative tool!" "I want to express my gratitude to the entire team behind PFC to MBOX Converter. I am not at all a technical person but due to some urgent need occurred to my brother, I used this tool. He assigned me a work to convert AOL PFC to Thunderbird MBOX file. He himself told me to use this utility for task accomplishment and I did the same. Seriously, without any hassle, I was able to perform conversion." "I am happy that I used this utility for the conversion of PFC email file to MBOX format. Now, I can easily migrate my data from AOL desktop email client to Thunderbird. This tool works smoothly on my Windows 8 OS. And, I am glad that it gave me positive results." "Due to very less time, I used this application. But this application was worth enough that I performed the conversion process within few minutes. Now, I think my decision of buying this software was right as I got the tool I wished for. Thanks!"